The Good News: This book contains some of the neatest looking projects I've seen, especially the "stacked ring bowl" and "logscape" shown on the front cover. In addition, each project pattern is on a page which can be photo-copied and enlarged or reduced to suit the desires or needs of the individual craftsman, or scanned into a computer for the same purpose; I fear that even with a flat-bed scanner accuracy would require that the page containing the pattern be cut out of the book, so you'd best own the book lest the librarian at your local public library becomes (justifiably) irate. 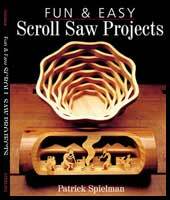 The book starts with a sound chapter on "basic [scrollsaw] techniques and information" which is followed by eleven chapters of various types of projects. The (only) Bad News: It appears to me that at least half of the projects in the book do not deserve the title's designation as "Easy" - "Challenging" might have been more accurate. AND the imaginative but often complex patterns would seem to cry for a CD or floppy disc to best input them into a computer for re-sizing and eventual printing, and avoid problems inherent with photo-copying.